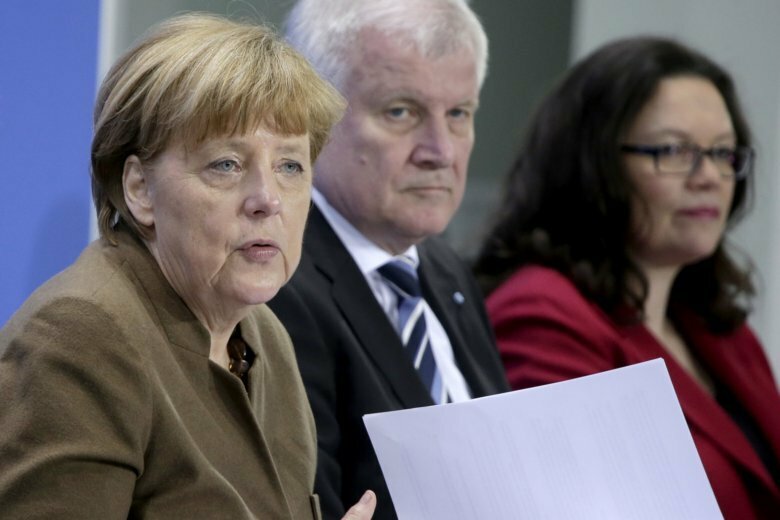 BERLIN (AP) — German Chancellor Angela Merkel said Monday that it’s time for her coalition government to stop getting bogged down in internal squabbles, after its leaders reached a deal to resolve its second major crisis in just three months. Merkel said she regrets the handling of the latest dispute, over the future of Germany’s domestic intelligence chief, and called for Germany’s biggest parties to move on from political infighting. On Sunday, coalition leaders resolved an increasingly farcical standoff over the head of the BfV spy agency, Hans-Georg Maassen. The center-left Social Democrats had demanded his removal after he appeared to downplay recent far-right violence against migrants in the eastern city of Chemnitz. Coalition leaders initially agreed last week to remove Maassen from his current job but make him a deputy interior minister — giving him a promotion and a hefty pay rise. Their decision unleashed a backlash that prompted the Social Democrats’ leader, Andrea Nahles, to demand its renegotiation. Maassen will now become a “special adviser” to Interior Minister Horst Seehofer, who has backed the official and refused to dismiss him, but won’t be promoted or get a raise. The saga has further battered the image of the coalition of Merkel’s conservative Christian Democratic Union, Seehofer’s Bavaria-only Christian Social Union and the Social Democrats, which took office only in March but had already been through one near-death experience over an apparently minor issue. It has highlighted personal and political tensions in an alliance that took six months to negotiate and appears short on both trust and energy. In last year’s election, all three governing parties lost support and the far-right Alternative for Germany entered parliament. In June, the coalition tottered as Merkel and Seehofer — a conservative ally but a persistent critic of her initially welcoming approach to large numbers of migrants in 2015 — sparred for weeks over whether to turn back small numbers of asylum-seekers at the German-Austrian border. “I regret very much that this could happen,” she told reporters in Berlin, without taking questions. Germany faces two major state elections next month — in Bavaria on Oct. 14 and in neighboring Hesse Oct. 28. The former in particular has been fueling tensions, with Seehofer’s CSU polling badly and speculation rife that a poor result could threaten his political future.